I know that I have ALOT to catch up on here on the blog, but real quick since it is my favorite cooking week of the year, I had to repost this Thanksgiving Turkey recipe. This is my tried and true go-to recipe for cooking a thanksgiving turkey that always turns out perfectly with little effort. The most difficult part is finding a container big enough to hold the turkey and brine and space in your fridge. If you are looking for an easy way to cook an AMAZING turkey try this recipe. I will sadly not be cooking this myself this year, with a 6 week old baby I had to let go of the privilege of cooking the Thanksgiving turkey for my urban family this year. However, this year’s hostess is planning to use this recipe so all is not lost and we can all bet on a tasty delicious turkey! Here is the recipe, originally posted in November 2009. You will soon learn how to brine a turkey, secrets to getting a great gravy and how to keep it moist. I know alot of folks are cutting up their turkey before cooking it this year. Try this brine before you do that, I promise you will never be in want of a great turkey recipe again! 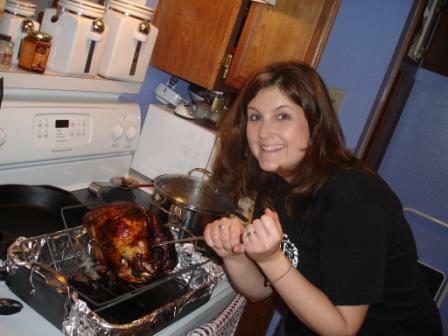 My first year of marriage, I cooked my first Thanksgiving Feast! My husband and my brother-in-law Brett were my culinary advisers as I set out to single-handedly cook the entire Thanksgiving meal. On a whim, I discovered the secret to Thanksgiving Turkey success. I was google searching turkey tricks and techniques when I came across a turkey recipe from none other than… LEGAL SEAFOODS. Thats right. A Seafood Restaurant, which happened to be my husband’s employer all through college, has a turkey recipe. This I had to try. And boy am I glad that I did. I had never heard of brining a turkey until I found this recipe. Basically you soak the bird in a bucket of apple cider and spicy goodness for 24-48 hours, then you cook it upside down until the very end to ensure all the good fat drips through the breast. Ive never made this recipe with the sausage stuffing that goes with it but this year I will! If you are looking for a fool-proof way to cook a turkey, try this brine. I promise you will love it. The hardest part is making room for the bucket of turkey in the fridge! 1. Don’t stuff the turkey. Stuffing draws out moisture from the bird, making the meat dry. Try cooking your stuffing separately in a casserole dish. 2. Baste constantly with pan juices. 3. Brine the turkey before cooking. This step, similar to marinating, will add great flavor and tenderness while helping the bird to retain moisture. Remember, a turkey will cook faster when not stuffed. And, when checking the temperature of the turkey, place an instant-read thermometer in the leg meat. Follow these instructions for a delicious Brined Turkey with Sausage Stuffing. Take your time with each step, and read through the entire procedure before you begin. Relax — it’s simpler than it looks! *You will need two 13-gallon plastic bags and one very large (16-quart) bowl that will fit in the fridge. Combine all ingredients in a large pot or bowl and stir well till sugar and salt are dissolved. Set aside. 1. Double-line a very large (about 16-quart) bowl with two 13-gallon plastic bags, opening one inside the other and draping excess plastic down around the sides of the bowl. 2. Rinse your turkey (8 – 10 pounds) inside and out, then place turkey in the prepared plastic-lined bowl. 3. Pour brine mixture over and around turkey. 4. Carefully draw up and gather tops of bags together, eliminating air spaces above brining liquid. Make sure to seal bags with twist-ties or clips. 5. Refrigerate turkey in brine for 18 to 20 hours. and patting dry inside and out. legs together loosely to hold shape. 5. Begin roasting. Then baste! baste! baste! baste! baste! every 20 minutes. Stop basting only for the final 20 minutes of cooking. If the turkey gets too brown too quickly, cover loosely with aluminum foil. 6. Cook for 2 to 2-1/2 hours or until internal temperature registers 160 degrees. 7. Remove turkey to a carving board and let rest about 15 minutes. 8. Meanwhile, pour off accumulated fat from roasting pan. Deglaze with white wine and add those fortified drippings to the gravy for more flavor. 2. Add sausage and cook till lightly browned, breaking up meat and stirring constantly. This can be made in advance and refrigerated overnight. Cook stuffing separately from turkey in a buttered hotel pan for about 45 minutes.